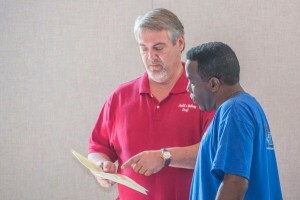 Tracey Webster of HealthMed, Inc., discusses health screening results with College Hill Baptist Church member Gary Heard. 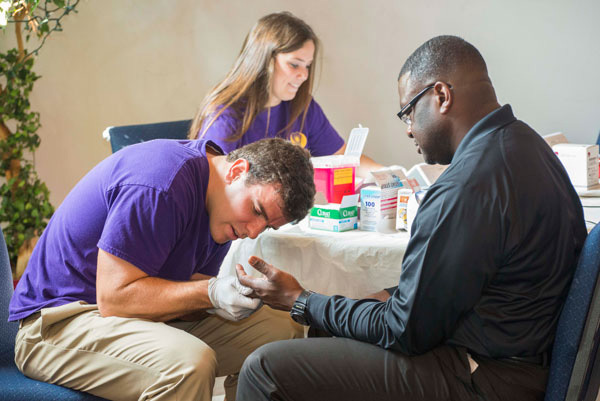 As part of the ongoing Saving Lives program, members of the College Hill Baptist Church were part of a health screening on August 24. This UA and community project has the purpose of making healthy living part of a church member’s faith practices. A scripture-based approach was purposely selected because of its compatibility with the existing religious and cultural norms of citizens in Alabama and the nation. The initial target audience includes leaders and members in Alabama churches. The audience will expand to include leaders and congregational members from synagogues and mosques located in rural Alabama and eventually across the nation. Saving Lives provides the opportunity for faith communities to apply their beliefs to improving their health and wellness. The initial churches of what will be a larger program in the area are College Hill Baptist, Plum Grove Baptist, and First African Baptist. UA students, faculty and staff are conducting the program in cooperation with local church leaders and congregations. Undergraduate students Zeb Akers and Lauren Tredeau work the health screening desk at kCollege Hill Baptist Church. Being screened is church member Anthony McMullen.